I headed to one of my favorite locations to hike and photograph. I went to Trooper Sperr Memorial Park in Big Flats, NY. I have been going there since before the tragic events that lead to its renaming. I had no real purpose in mind. Just wanted to walk and clear my mind. I took my camera gear just because I always take it just in case, but I wasn’t really planning to photograph anything. Today I decided to park at the far end of the trail as the bridge was out at my usual parking spot and would require me to drive the long way around to get there. This was fine because it had been a while since I had walked the whole path and I was looking forward to this opportunity to do so. It also worked out well because I was able to have some photographic opportunities that I would not have had if I had only been at my normal area. As I walked I saw how nice and blue the sky was. 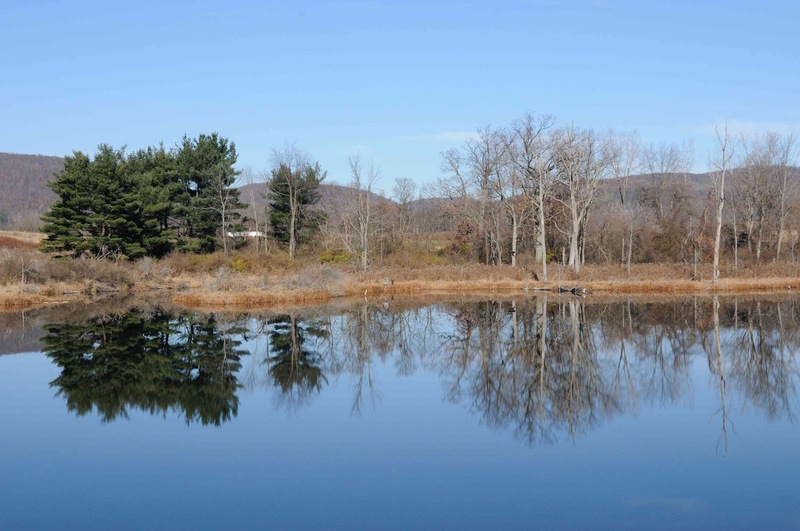 I noticed how the trees were reflecting nicely in the water of the large pond. I did a double take. Thought about stopping to take some photos. Kept walking. Then went back put my camera bag down on the park bench and got my camera out. I composed photos at different angles and with different focal lengths. With lots of sky and little water and lots of water and little sky. As I continued to walk along I heard the splash of birds landing in the water. I didn’t think too much of it as I assumed it was some mallards or Canada geese landing, which are pretty common sighting for me and I had no desire to photograph them at this time. To my surprise when I came to a clearing in the bushes that lined the pond’s bank I saw that the birds were neither mallards nor geese. 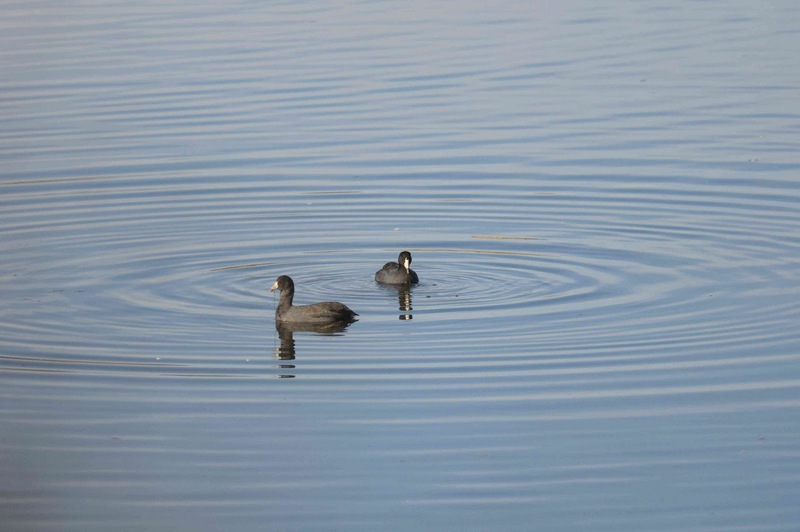 They were American Coots which are pretty uncommon in my area. I have only seen them on a few occasions and never in this location. They were a little ways off but I figured it was worth stopping to get a few shots of a bird I do not frequently see even if they would not be very close. So I once again dropped my camera bag and this time I pulled out my gear for bird photos. I liked the ripples created in the water as the dove and resurfaced. It was tricky shooting as they moved along the surface of the water they continued to be screened from my view by the bushes. I finally got to my usual area at the park and saw from a distance a hawk swoop down and land on a street sign. I was quite surprised as the hawk landed right across the road from a car where people were getting into it and driving away. 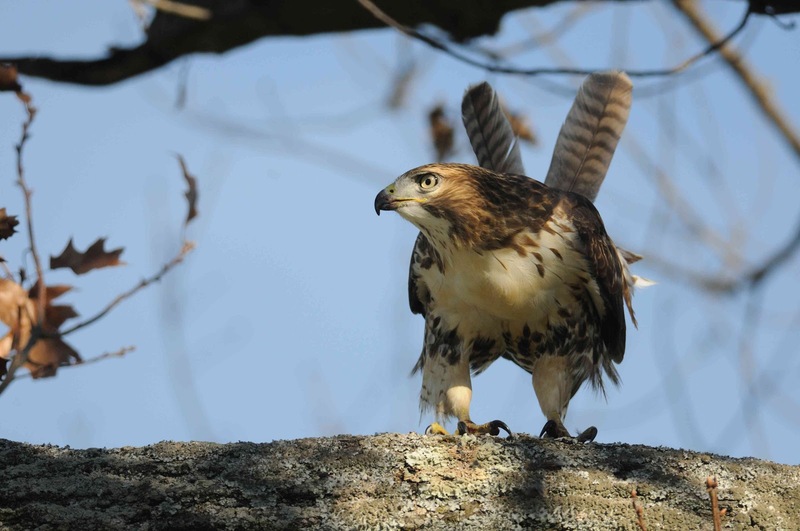 In my experience hawks are generally skittish of humans and avoid or fly away from humans when they are near. Since this one blatantly approached an area already occupied by humans I thought this was a good chance to get close and get some photographs. I thought that if it didn’t mind the ones already being there it was a safe bet it might not mind my approaching it too much. I was still a good distance away and had to hurry so I could get there before it flew off. 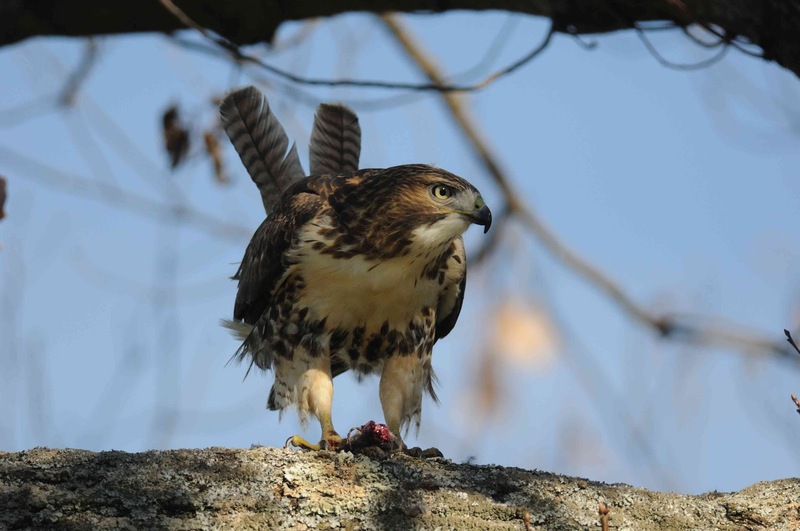 I arrived at the location of the hawk and slowly approached. 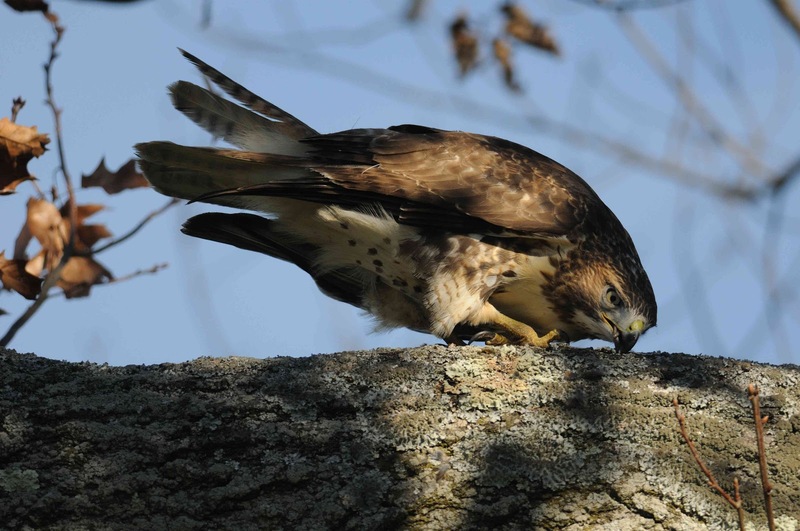 I took only a few steps at a time and I kept an eye on the hawk, watching it for any signs of distress so I could stop before disturbing it too much and scaring it off. I also took photos after every few steps documenting my approach. Then my worst fear, when I am photographing, was realized. More people heading my way. A car was driving right toward me and stopped and parked in the parking lot and people noisily unloaded from the car. 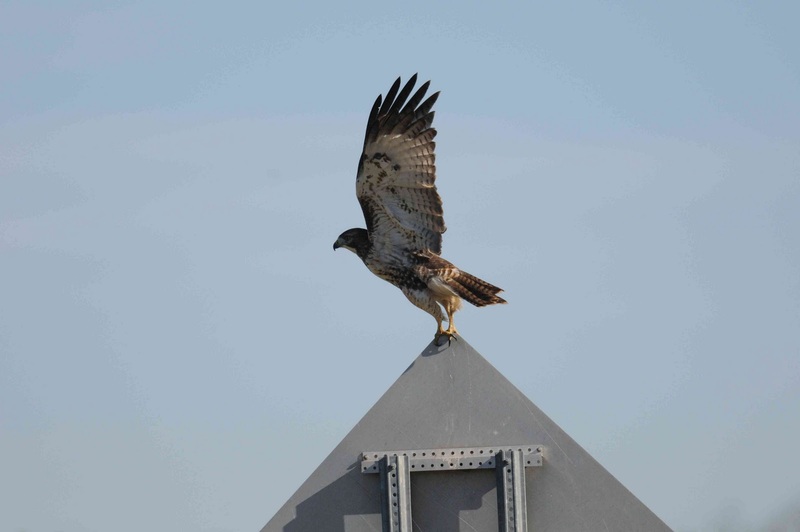 I knew this was likely to cause the hawk to take flight so I kept my camera trained on the hawk. The hawk did indeed take flight but to my surprise it did not fly off into the sky. It flew only a few yards away and down to the ground. Shortly thereafter the hawk took off again and flew up the road and landed on another street sign. I decided I would hang around a little bit and see if it came near again. As I was looking around I saw a flutter in my peripheral vision. I turned and saw that the hawk had landed in the tree about ten yards away from me. I was quite surprised that the hawk would land in a tree so close to a human. I immediately began to photograph it. It did not seem to be phased by my presence. I decided to see if I could move around and get a better angle without disturbing it. I was able to move around quite a bit without noticeably disturbing the hawk. As I photographed it I noticed the hawk was eating something. Apparently after heading up to the second street sign it caught some prey and returned to this tree to eat. I imagine this must be part of its regularly visited territory and it comes here often to eat and may be used to the presence of humans. I was able to photograph it the entire time it ate until it had fully consumed its meal. Then it wiped its beak off on the tree branch and eventually took flight. It still did not travel too far as I spotted it atop a light post at the park’s entrance opposite where I had entered. Alas it was time for me to leave. I could not wait for its return.